Raphaël Nadjari came to cinema somewhat by happenstance. Trained in visual arts, he moved from painting to filmmaking almost twenty years ago. Of French and Israeli origin, he has made three films in New York: THE SHADE, APARTMENT 5C (both shown at the Cannes Festival) and I AM JOSH POLONSKI’S BROTHER (shown at Berlinale). He followed these up with three Hebrew-language films shot in Israel (including AVANIM, which premiered at the Berlinale, and TEHELIM, which was presented in competition at the Cannes Festival) before making his French-language debut with NIGHT SONG, shot in Québec. 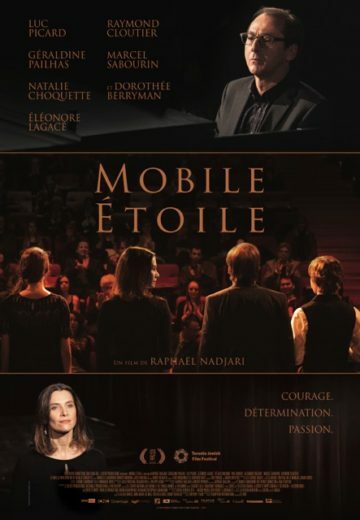 Hannah, a singer with a passion for classical music, heads a choir in Montreal alongside her pianist and husband, Daniel. They live off concerts featuring sacred French music, true heritage gems, written for French synagogues at the beginning of the 20th century. Recently, however, they have had trouble making ends meet for the vocal group. The pressure is felt on the couple and the family. Just after recruiting Abigail, a fragile but talented young woman who gives them hope for the future, Hannah’s former teacher Samuel arrives in town with the sheet music for a piece long thought lost.